TED | Ingredients to Share, Ltd.
Posted on May 10, 2013 by Ingredients to Share, Ltd. While thumbing through my new iPhone app – TED talks, I found this remarkable newly released video from the conference in February. I was fascinated by Savory’s ecological research over the past forty years and his charting of the profound visual and substantive positive and natural changes in the landscape from virtually dying land in various areas of the continent. This researcher should be heralded for his life’s work and passion. He is truly a remarkable contributor to a new era of thinking and re-evaluation of the methods that we have previously employed. I also reviewed the ensuing long list of feedback comments from other viewers of this TED talk and saw how quickly the topics of discussion turned into a “vegan and animal rights vs. ecological stability” argument. One commenter, David Heigis writes, “What Allan is suggesting is a more natural system based on how nature actually works and has been working for quite a long time. The moral issue on who eats what has no place in this. Going back to a more natural system in producing food where grass eaters place a crucial role, especially when it comes to reviving dead land, IS the only way to go. It should be obvious to anyone. And as in all working sound ecosystem there is (a) food chain that is there to keep the balance of everything. To suggest that we can construct a better system than nature has already done is nothing short of naive and a belief that has put us in the situation that we are currently in.” (May 3, 2013; TED talks, reviewer comments section). Please enjoy this short video on the groundbreaking ecological research of Allan Savory. 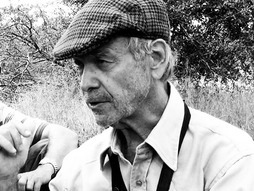 Allan Savory works to promote holistic management in the grasslands of the world. In 1992, Savory and his wife, Jody Butterfield, formed the Africa Centre for Holistic Management in Zimbabwe, a learning site for people all over Africa. In 2010, the Centre won the Buckminster Fuller Challenge for its work in reversing desertification. In that same year he and his wife, with others, founded the Savory Institute in Boulder, Colorado, to promote large-scale restoration of the world’s grasslands.